On the desks of the Acting Vice Chancellor of the University of Education, Winneba, Reverend Professor Anthony Afful Boni and Professor Emmanuel Nicholas Abakah, the Chairman of the Governing Council of the university lies an unacknowledged letter from lawyer for six officials of the institution who face the specter of being deprived of their daily bread and hard earned reputations. The six: Ing. Daniel Tetteh, Mary Dzimey, FrankOwusuBoateng, Dr. Theophilus SenyoAckorlie, and Prof. MawutorAvoke, are, amongst others, demanding their immediate and unconditional reinstatement to their various offices to perform their functions in accordance with law. The officials are also demanding an immediate and unconditional restoration of the salaries, allowances and privileges attached to the various offices of the Affected Officers which have been withdrawn by the two, and “payment of all outstanding salaries and allowances withheld from the Affected Officers together with interest thereon”. The ten-pagerletter, dated 22 January, 2018, catalogued how on or before May 2017, some influence peddlers, together with the Council have, in a calculated attempt, frustrated and hounded the official from their offices without any just cause, contrary to the dictates of the 1992 Constitution of the country. The letter reads in part that: On 23rd May 2017, one Supi Kofi Kwayera (the “Applicant”) commenced an action in the High Court, Winneba, against the University of Education, Winneba (the “University”) and the Minister of Education for alleged breaches of the University of Education, Winneba, Act, 2004 (Act 672) and the Public Procurement Act, 2003 (Act 663) as amended. The gravamen of the Applicant’s plaint was that the tenure of the then Council had been illegally extended and as such the Court should declare the said extension and all appointments made by the said Council void. The Lawyers of the University, MessersGaisie, Zwennes, Hughes & Co., challenged the capacity of the Applicant to bring the action and the jurisdiction of the High Court, Winneba, to entertain the action. However, the High Court dismissed the objection and assumed jurisdiction over the matter. Pursuant to the said action, the Applicant applied and secured an injunction restraining the Vice-Chancellor, Professor MawutorAvoke, and the Finance Officer, Dr. Theophilus S. Ackorlie, from exercising their functions as Vice-Chancellor and Finance Officer respectively until the final determination of the case, although they were not parties to the said action. The two officers were appointed to office by the impugned council. The High Court also directed the Pro Vice-Chancellor to act in the absence of the Vice-Chancellor, although the Pro Vice-Chancellor was also appointed by the self-same impugned Council. The Lawyers of the University, in their attempt to properly defend the University before the Court, this paper gathered, filed an appeal against the ruling of the High Court to assume jurisdiction over the matter, an appeal against the Court’s grant of the interlocutory injunction restraining the Vice-Chancellor and the Finance Officer from performing their functions, and an application for a stay of execution of the interlocutory injunction pending the appeal. On 18th July 2017, the Pro Vice-Chancellor, who did not have a letter from the President appointing him to the Council of the University, was sworn into office along with the new Council of the University. On that same day, the Registrar, purporting to act on the instructions of the Council, which was yet to hold its first post-inauguration meeting, wrote to the Vice Chancellor, Prof. Avoke, to hand over to the “Pro Vice Chancellor who has been appointed to act” in his absence. On 21st July 2017, the Council acting through the Chairman wrote to the Lawyers of the University to give them “a strong instruction … to immediately withdraw the whole appeal process filed such as the ‘Notice of Appeal’ and the ‘Stay of Execution’ at the Court of Appeal and the High Court, respectively ...”, although there were strong genuine legal grounds on which the appeal and the application for stay were filed. The Council subsequently took away all the privileges of the injuncted Principal Officers, including revoking all their allowances and all the emoluments that go with their offices, except their official residences and vehicles and the payment of their basic salaries. By letters dated 1st August 2017 and 15th September 2017, the Council directed the Vice Chancellor, Prof. Avoke, to prepare Handing Over Notes for the Ag. Vice-Chancellor despite protests from his Lawyers that he was substantively in office, albeit, temporarily injuncted. The Council, at its meeting on 17th August 2017 decided to form a fact-finding committee to adequately inform the Council about the issues relating to the lawsuit at the Winneba High Court and also to prepare adequately to defend itself in respect of the suit pending before the High Court. At an emergency meeting of the Council on 31st October 2017, the Fact-Finding Committee presented an interim report on its findings to the Council. This was done despite the fact that the Committee had, on 25th October 2017, at an Emergency Meeting of the Council, called purposely to extend the deadline for the submission of the report of the Committee, asked for a two-week extension from 1st November 2017 to complete its work, and despite the fact that the Chairman of the Committee was out of the jurisdiction. Contrary to laid down procedures, the interim report of the Committee was not circulated among members of the Council prior to the meeting. The report, which had not been signed by any of the members, was also presented at a meeting of the Council, where the Chairman of the Committee and another member of the Committee were not present. On the same day that the interim report was presented, the Council, purporting to act on the interim report of the Fact-Finding Committee, directed some six officers of the University (the “Affected Officers”), including five of our Clients, to “step aside” for the Committee to complete its investigations. The Council, through the Chairman, subsequently issued a number of Press Statements essentially pronouncing the Affected Officers guilty of the allegations leveled against them, despite the pendency of the investigations of the Fact-Finding Committee and two court actions in the High Court and the Supreme Court. These include a publication on page 77 of the 11th December 2017 issue of the Daily Graphic, where the Chairman categorically accused the Affected Officers of criminality, malfeasance and sleaze, as well as circumventing procurement processes. On 20th December 2017, the Supreme Court, upon an application by the University Teachers Association of Ghana, Winneba Chapter, (UTAG – UEW) quashed the decision of the High Court, Winneba to assume jurisdiction over the matter brought before it by Supi Kofi Kwayera and set aside the application of Supi Kofi Kwayera invoking the jurisdiction of the High Court. Following the decision of the Supreme Court, the Council, at its meeting on 28th December 2017, in which the Pro Vice-Chancellor participated, reappointed the Pro Vice-Chancellor as acting Vice-Chancellor. a. By the decision of the Supreme Court on 20th December 2017, everything that was done by or in the High Court, including all orders and directives issued by the Court, have been rendered null and void and of no effect. Accordingly, no person can purport to act based on the pendency of any orders of the High Court in respect of this matter. b. The Fact-Finding Committee set up by the Council was to assist the Council to prepare and defend the University in respect of the matter pending before the High Court, Winneba. That matter having been completely quashed by the Supreme Court, and there being no case before the High Court, the causacausansof the Fact-Finding Committee has ceased to exist and the Committee has become functus officio and cannot therefore purport to be carrying out any investigations. c. Since the reason for directing the said Officers to “step aside” was to allow the Committee to carry out its investigations, so as to inform the Council the better to defend the University in the High Court, and since the Committee has become functus officio by virtue of the said case having concluded, the Affected Officers are entitled to be reinstated with immediate effect to perform their duties in accordance with law. d. Again, the appointment of the Pro Vice-Chancellor by the Council to perform the functions of the Vice-Chancellor was to last “until the final determination of the suit”, and since the suit has finally been determined by the decision of the Supreme Court, the Pro Vice-Chancellor cannot purport to continue acting or performing the functions of the Vice-Chancellor. The Vice-Chancellor is entitled to be immediately reinstated to perform his functions in accordance with the 1992 Constitution of Ghana; the University of Education, Winneba, Act; and the Statutes of the University. e. By Rule 5 of Schedule G of the Statutes of the University, no major penalty shall be imposed on any person except upon the recommendation of a committee made up of “official(s) within the University above the rank of the person to be disciplined”, established to conduct an enquiry into the charges. By the same Rule, where the person to be disciplined is a Senior Member, the only committee that can make that recommendation is the Disciplinary Board established under Rule 6 of the same Schedule. By the same Rule 6, the person to be disciplined “shall be served with written charges and be given the opportunity to state the grounds on which he proposes to exculpate himself/herself.” Further, by statute 36 (c) and (d) of the Statutes of the University, suspension and/or interdiction are major penalties and can only be imposed on Senior Members by the Vice-Chancellor in consultation with the Council and acting on the recommendation of the Disciplinary Board established under Schedule G. The Fact-Finding Committee, which included a person who is not an official of the University, had no power to recommend the interdiction and/or suspension of the Affected Officers, and the Council cannot purport to act on such a recommendation. 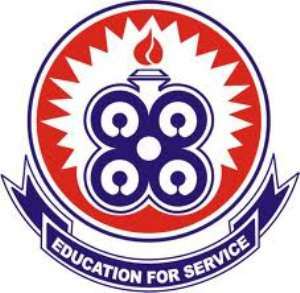 f. The suspension and/or interdiction of the Affected Officers without serving them with written charges and without any enquiry by or recommendation from the Disciplinary Board of the University is wrong as it sins against the disciplinary procedures of the University and Article 23 of the 1992 Constitution of Ghana – which requires Administrative Bodies to comply with the requirements imposed on them by law. g. The re-appointment of the Pro Vice-Chancellor as the acting Vice-Chancellor in a meeting in which he actively participated amounts to conflict of interest contrary to Article 284 of the 1992 Constitution. h. The re-appointment of the Pro Vice-Chancellor as an acting Vice-Chancellor after the Supreme Court’s decision is not justified, since the main reason for the appointment of the Pro Vice-Chancellor was to comply with the orders of the Winneba High Court. This is more so when the Pro Vice-Chancellor was involved directly or indirectly in the award, approval, execution and/or commissioning of the contracts under investigation by the Economic and Organised Crime Office (EOCO) and the Bureau of National Investigations (BNI). It will be recalled that this matter had been raised earlier at the maiden meeting of the Council which appointed the Pro Vice-Chancellor as acting Vice-Chancellor, but the Chairman ruled that in order not to flout the orders of the High Court, he ought to be appointed. i. The Pro Vice-Chancellor was a member of the Management Team of the University, and took part in the decision to award, approve and/or execute contracts for the projects, which were the subject-matter of the BNI and EOCO investigations. The Pro Vice-Chancellor was also a member of the University Council that approved the said contracts. The Pro Vice-Chancellor indeed signed some payment vouchers in respect of the same contracts and has his name on the plaque commissioning the roads at the North Campus gate, which is one of the contracts under investigation. It is therefore unreasonable and amounts to a breach of the rules of natural justice to ask the Vice-Chancellor to step aside while the Pro Vice-Chancellor, who participated in the awards of these same contracts in issue, takes over. This raises an issue of bias and conflict of interest contrary to Article 284 of the 1992 Constitution and does not amount to acting fairly and reasonably in accordance with Article 23 of the 1992 Constitution of the Republic of Ghana. It is therefore not surprising that some documents have been removed under the watch of the Acting Vice-Chancellor. j. The current Chairman of the University of Education, Winneba, Council was also the Pro Vice-Chancellor and a member of Management at the time construction works on the North Campus roads begun. It is therefore strange that the Chairman will superintend upon an investigation in respect of the award and/or execution of the very contract he participated in its award and/or execution. Again, this raises an issue of conflict of interest and a breach of Administrative Justice contrary to Articles 23 and 284 of the 1992 Constitution of the Republic. k. The Chairman of the Council and the Pro Vice-Chancellor, having participated in the award, execution and/or commissioning of some or all of the contracts under investigations, cannot superintend over any investigations in relation to those contracts, as same is contrary to the principles of natural justice and constitutes a breach of Articles 23 and 284 of the Constitution. l. The Council, through the Chairman, has issued a number of Press Statements where prejudicial statements have been made against the Affected Officers. It is clear from the said statements that the Council has concluded that the said Officers are guilty of the allegations levelled against them, even before they have an opportunity to state their case. The Affected Officers can therefore not get a fair hearing from the Council, contrary to Article 19 of the Constitution. The acts of the Council point to a real likelihood of bias and the Council ought to be dissolved for a new Council to be sworn in if any investigation is to be carried out fairly. m. The decision of the Council to compel the Lawyers of the University to withdraw the appeal and the application for stay of execution was borne out of malice, calculated to ensure that the Vice Chancellor and the Finance Officer stay out of office, and to perpetuate a wrong that had been committed by the High Court, Winneba. n. By statutes 6(a), 36 and Schedule G of the Statutes of the University, the Vice-Chancellor is the chief disciplinary officer over all officers of the University. The Council only acts as an appellate body. Per the orders of the High Court which were then subsisting, the Council having delegated its disciplinary powers to the Vice-Chancellor, had no power to discipline the other five Affected Officers at first instance when there was an acting Vice-Chancellor at post”. Meanwhile, as at the time of filing this story the two Professordid not pick our calls to respond to the issues.